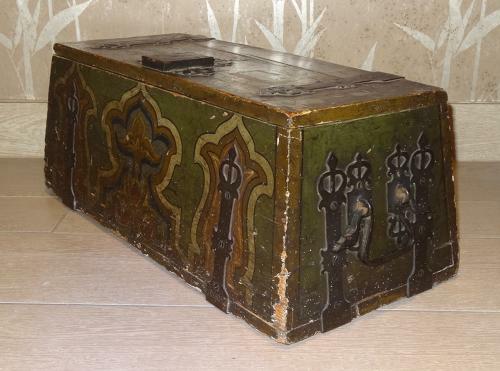 Interesting and unusual Bulgarian Arts & Crafts/Folk Art painted wooden wedding box! Gothicky style metalwork and design. Dated for 1897 (with presumably the monogramme of the bride & groom) and also with "Varna"; the famous Bulgarian seaport. Bulgaria was given independence round that time and 1897 was also the year Bram Stoker's Dracula was published. Coincidentally, the Count Dracula Society in Whitby is located at Varna House there! Hence our calling it our Count Dracula box; just an interesting by the by. Approx 23" wide, 9" high, 10" depth.